When I think of wearables and cars I picture this scenario: a man in a suit rushing out of the house in the morning gets to his car and starts frantically patting down his suit jacket and trouser pockets looking for his keys. Then he looks down at his wrist and remembers he's got his Apple Watch on. A single tap on the screen and the car door clicks open. That functionality goes from the smartphone through to the companion app on the smartwatch. This is Ford's Sync platform in action, letting you open doors and even rating your driving. It's a simple application of wearable tech, it's probably what you associate with wearables and cars too, but Ford has much bigger ambitions. At its Research and Innovation Centurion in Dearborn, Michigan, the automotive giant has been busy setting up an Automotive Wearables Experience lab where it's been exploring the connection between wearables and driving, specifically connecting the health monitoring features of smartwatches and fitness trackers with in-car technology. It's hoping the data can be used to evaluate whether you've had a enough sleep to be behind the wheel or even benefit semi autonomous driving using biometric data to signal to the driver that it's time to grab the steering wheel and take control again. According to Gary Strumulo, Ford's global manager for vehicle design and infotronics, bringing the two worlds together fits nicely into the company's philosophy for introducing tech inside its cars. "One of the things Ford talks about is being able to create a better world in addition to developing great products," he told us. "From the better world standpoint, we thought that no one is really looking at bringing health and wellness inside the vehicle. Very recently, Frost & Sullivan, a large market research company, listed that the brand differentiation for the vehicle OEMs in the future would be two things. One will be autonomous driving and the other would be health and wellbeing. "It was in that context that we looked and realised that people spend an enormous amount of time in their vehicles. Just in the US alone, it's estimated by the department of transportation that we spend 500 million commute hours per week in our cars. We saw this as a great opportunity to monitor their wellbeing." Strumolo has been at the company for 26 years in a variety of roles including building Ford's full scale driving simulator. He confesses to being a bit of a geek and wears more than one wearable at a time. He's also a little surprised that automotive companies have not connected the two industries sooner. "I think the car provides a great opportunity for wearables," he explained. "When you're in the car, we don't want you to see your phone. We don't want you to touch your phone. The wearable might be a great way to get communication to you without taking your hands off the wheel or eyes off the road too much. "As people have become more interested in their wellbeing, not because they have an illness but simply because they have an interest in tracking their wellbeing and fitness, that's become far more prevalent and there's an opportunity for that to come inside the car." 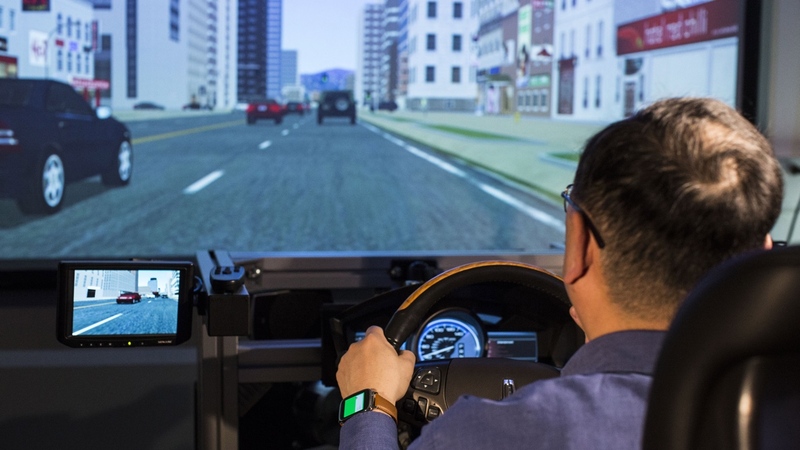 The lab has already identified some of the areas they want to explore with wearables and a key focus is chronic illnesses that could affect driving. "Take people who are diabetic for example. If they go hypoglycaemic they get confused, lightheaded suffer and blurred vision, that's a big problem when you're operating a car," he said. "So if they were wearing a device which was able to tell if their blood sugar level was low and when it was trending, getting that information inside a car would be helpful so they could take corrective action before it becomes a problem. "So we looked at those kind of chronic illnesses like diabetes, asthma and allergies and saw that bringing this information into the car would be great, but in other cases, making those measurements inside the vehicle were also critical." Another area of focus is stress. It's something we've earmarked as a big trend in 2016 in our Wareable 50. Fitbit is working on incorporating stress data into its fitness trackers, while Withings has already found stress metrics in its sensor data. Very few companies have been able to showcase stress monitoring, but Strumolo believes it could have a big impact if you have your fitness tracker on inside the car. "We're really interested in looking at how stressed the driver is," he said. "We want to understand that stress level and so we were interested in making measurements of stress. So the obvious data we can look at is heart rate, skin temperature and galvanic skin response. The typical things you'd see in a lie detector machine, which indicates stress. "We first looked at putting them inside the car itself, those sensors, maybe putting them into the back of the seat. But the problem with that is you have to put them in the car and you have to modify the seat, you have to schedule a procedure to get those seats put in. You make a decision on technology and typically it takes about five years for the car to be released. So you're dealing with an expensive thing that's late to market and has to be rolled out to different lines and different time frames and is probably obsolete technology." Wearables are no longer just about the wrist. There are trackers you can wear on your ankle, your bra or in the ear, and smart clothing continues to gather momentum. I'm intrigued to know whether Ford is exploring other forms of wearable tech and which of the existing devices they see as bringing value to its research. "So there are clearly a number of different types of wearables we'd certainly be interested in," said Strumolo. "Smartwatch or fitness band-type devices are very interesting to us. Something like the Basis Peak watch is an interesting device for a number of reasons. One because it measures beyond the usual PPG measurement for heart rate. It will measure GSR (Galvanic Skin Response) and skin temperature. It will do sleep analysis and that's a good thing for the car to know the next day. If the car knows you've had a bad night's sleep, then it could potentially do things in its system to compensate for that." Strumolo also sees a future with drivers wearing smartglasses in the driver seat: "Augmented reality provides us with a very interesting opportunity because again it might be an avenue for replacing a heads-up display that's built into the car and is an expensive item to do. The challenges are to control the amount of material that's displayed so it doesn't become distracting to the driver." Strumolo didn't, however, have great things to say about Google Glass. There had been talk of Ford integrating Glass a couple of years ago, but Strumolo was unconvinced it was really ready for the car. "Google's implementation, not to be mean, was not very good," he said. "It did have the image in the upper right hand corner, so when you viewed it you really had to look up to really see it. That made it rather difficult. You also to some extent had to refocus your eye and that again becomes a problem especially for older people attempting to focus in the near field and far field. "There's a better approach from wearables like the Epson glasses and the Sony SmartEyeglass, which attempts to float a virtual image directly in front of you so you are looking through it and can see everything in front of you but you also see this virtual image." It's not just AR glasses that need to continue to evolve over the next five years. Strumolo shares a concern with many smartwatch and fitness tracker owners and that's battery life. "If you're pinging the device constantly, that's a Bluetooth ping and that's power hungry. Even if that's Bluetooth Low Energy, you don't want it to be pinging all the time because you'll just drain it. "So how we intelligently get the data off the device only when we need that information is critical. If I'm measuring your heart rate, I don't need you to tell the car every second that your heart rate is 70bpm because that's fine. But if the heart rate exceeds a certain threshold, then it would be good to get a ping at that point to see that the heart rate jumped beyond a pre-described threshold." So what is the key to unlocking wearables in the car now and in the long run? Strumolo believes voice control and notifications have a major part to play. "I think voice commands through the watch could also be very powerful," he explained. "It's something that goes back to what happened with the smartphone. People say 'I don't use Siri, or Google Now or Cortana because I can just as easily do that on my phone'. That may be true but in the car, we don't want you to touch your phone, look at it or manipulate it. "So Siri in the car could be very powerful because all you do is press a button the steering wheel and you can get answers to your questions. I think that wearables provide us with the same use case. This is the opportunity that wearable tech has inside the car which would otherwise be available without it. "The things I think will be coming later relate to notifications through the wearable while you're driving. A very simple example of this could relate to the navigation system inside your car," he said. "So you're driving along and using the navigation and your watch is connected to this system, so it's matching what's going on. If the wearable is on, you'll get a buzz to tell you the turn is coming up now and that would be the only prompt you'd need to either look at the screen and see you need to get off at the next exit. You don't have to take your eyes off the road."